It may have a utilitarian look compared to Guild's semi-acoustics, but this full-throated solid-body still delivers on build quality, playability and tone. History, build quality and immaculate finish. Clarity and punch to the humbuckers. Guild's S-100 Polara debuted in the late 60s, a time when the hippy movement was dying out. Free love gave way to cynicism, and the S-100 Polara reflected that. Now it's back as part of the Korean-made, vintage-specced Newark St range. A stripped-down, double-cut slab of mahogany, with two Anti-Hum Dual Coils in neck and bridge, the Polara feels like a utilitarian riposte to ostentatiously spec'd guitars. "There's a bright clarity and punch to the Polara's tone, like a post-pubescent Tele Deluxe"
That the nickel-plated stop tailpiece sits at an angle underscores the Polara's position as an iconoclastic take on the Gibson SG, a position in sync with the body's symmetric cutaways. It comes fitted with no frills but super-steady Grover Sta-Tite tuners. It shares the history, build quality and immaculate finish of its Newark St siblings the Starfire IV and M-75 Aristocrat, but it has the density of tone you'd expect from the series' only solidbody. And it feels timeless: modern then, and still so now. That it is Kim Thayil from Soundgarden's guitar of choice tells us a lot about its capabilities. 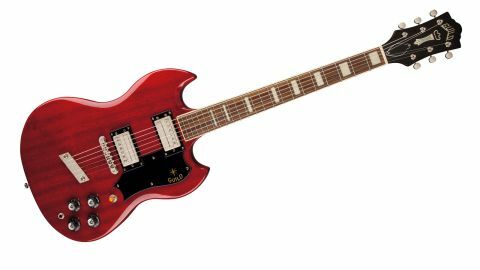 Slightly uncomfortable played seated, it comes into its own when strapped on, with a playing experience and sound that makes it an ideal - not to mention £300-odd cheaper - alternative to, say, an American SG. That those 'buckers are not red-hot never put Thayil off. There's a bright clarity and punch to the Polara's tone, like a post-pubescent Tele Deluxe, which can handle overdriven rock riffs, with just enough mahogany to thicken up your sound when opening your amp up full.